A Wood Frog at Riverbend Park. This past weekend, Brad's parents fled the more than foot of snow on the ground at the house in the Poconos to visit us. On Sunday, to celebrate Spring in February, we took them and the girls to Riverbend Park in Great Falls. As we sat at a picnic table eating lunch among the other families swarming the park to revel in the unseasonable weather, Brad made a wry observation. "It's like President's Day is the new Fourth of July." And looking out across people grilling and kicking soccer balls and even kayaking in the dead of winter, it did indeed look like summer – save for the fact that all the trees were bare. Earlier, we'd taken a walk on a crowded path along the Potomac River. We saw leaves starting to form on the trees. Perennials poking through the dirt. Sap running on one maple tree was covered in ants, flies and moths. We'd been walking maybe 30 or 40 minutes when the girls started grumbling. "I don't think I can walk much farther. I'm soooo hungry." "Moooooom, my legs are tired. I'm starrrrrving." "Mom. My stomach is empty. It's saying, 'I need lunch!'" Heeding to the girls' increasingly desperate pleas for lunch we headed back to the parking lot. 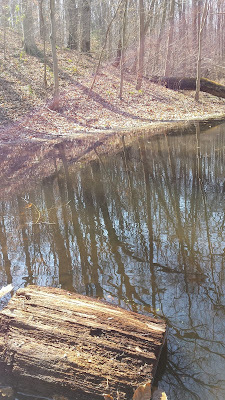 The path took us past a pond – in the middle of the woods. A kind of magical sight on its own. As we neared the pond we heard an odd sort-of quacking sound that got louder the closer we got. Like there was an entire flock of arguing mallards – well kinda. Like, an entire flock of arguing mallards who'd just sucked on a giant helium balloon. Only when we came within view of the pond, there were just two lone ducks floating on it. And neither were making a peep. The quacking was in stereo though. 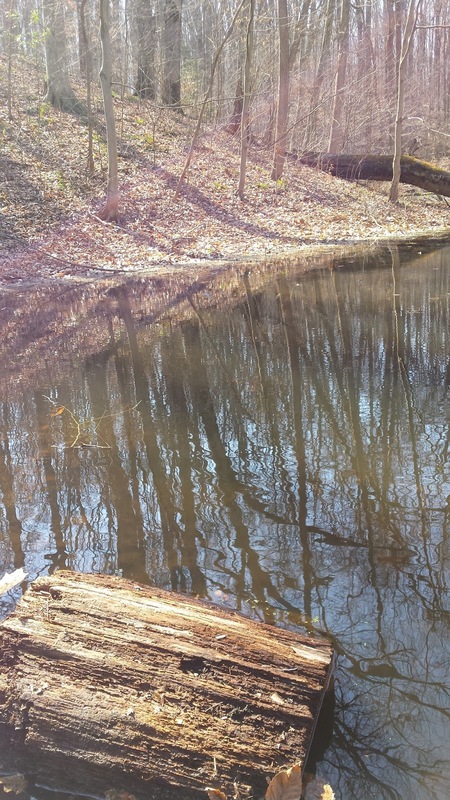 We scanned the pond and around its banks. 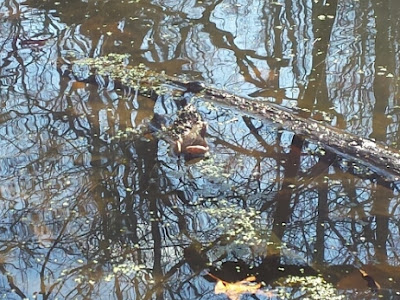 In addition to the quacking, there were irregular plopping noises. The sun glittered off the backs of shiny things surfacing then diving in the water. "What are those?" we all wondered aloud. And then with a crackle, something leaped out of the leaf litter on the shore and splashed in the water. A frog on a log. There were dozens of them. All swimming along the shoreline. The pond and the hoppin' hillside. We looked up the hillside that lead down to the water and heard the distinct rustle of dry leaves as frog after frog jumped toward the water in an amphibious parade. And a bit unsettling. At least to me. I'd just read Barbara Kingsolver's "Flight Behavior" about a kaleidoscope of monarch butterflies (that's what a group of butterflies is called – a kaleidoscope – so perfect, right?) mysteriously landing in a forest in Appalachia instead of Mexico where they'd overwintered for thousands of years previously. An entomologist/ecologist arrives to study the butterflies – he blames climate change for their unprecedented behavior. The butterflies taking a winter break in the mountains of the Southeast United States is not just a strange phenomena or a miracle from heaven (as the locals in the story believe it might be); as the temperatures fluctuate between unseasonably warm to freezing, the entire swarm of butterflies is at risk of dying out, decimating the species. As I watched these frogs wake up from their winter hibernation and make their way to the pond on a 72-degree day in the dead of winter I had a sickening feeling. It's too soon, I thought. Too early. What happens if it the temperatures go down again and they all freeze to death? Frogs are one of those indicators of environmental health– what were these February mating calls telling us about the health of our planet? Still, it was hard not to delight in the moment. The reverberant frog quacking. The girls shouting in glee "There's one! There's one!" The vibrant blue sky and the sweatshirts tied around waists. Left up to me, I would've camped out by that pond to watch the frogs. But the girls' hunger pangs resurged as soon as their interest in the frogs flagged. We trekked onward. But I worried about those frogs. At home, I pulled up pictures I'd snapped on my phone and started Googling pictures of frogs native to Virginia. I came across the Virginia Herpetological Society, which not only had pictures of different frog species, but also recordings of their calls. This made for a fun activity for the girls and me – comparing our memory of the quacking frogs to the recordings online. 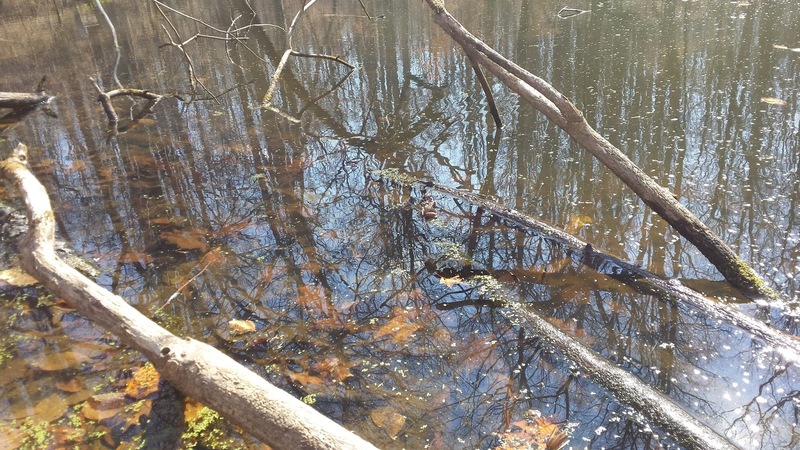 Eventually, we heard a match: The Wood Frog. As I scanned information about the Wood Frog's hibernation and mating habits, I breathed a sigh of relief. "This species is adapted to the cold and ranges farther north than any other North American amphibian or reptile. It appears very early in the year, and males are often heard calling before ice-out on the ponds." It's not unusual for males to start quacking for mates in late January or February. I had not witnessed the frog-pocalypse, as it turned out. At least not that day. Wood Frogs are found in northern forests in Canada and Alaska where winter temperatures can dive to -50 degrees Fahrenheit. And here's where things get interesting: in order to survive these temperatures, the frogs don't do what I do, which is dress myself in seven layers of wool and fleece and spend winter under a cozy throw blanket sipping tea and refusing to leave the house. 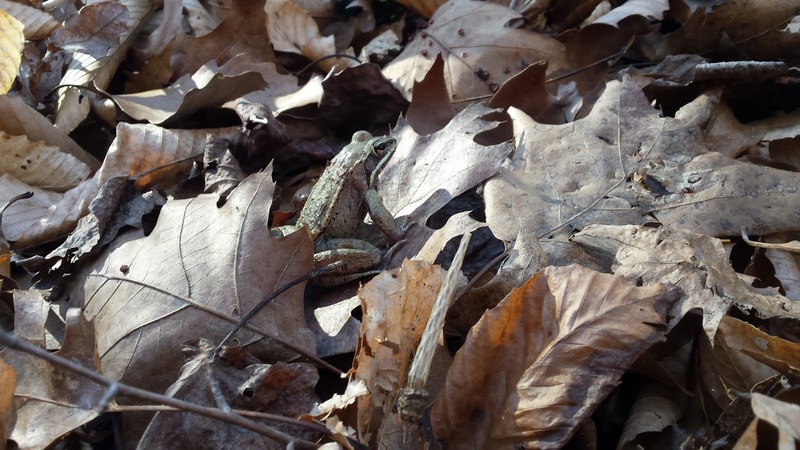 No, when they hibernate, Wood Frogs bury themselves in leaves (unlike other species that hibernate underwater). As the air temperature dips, so does the frog's body temperature. And when air temperatures hit freezing, so does the frog's body temperature. "Yet wood frogs have evolved ways to freeze solid for up to eight months each year," according to the National Park Service. You should check with NPS to learn how all this goes down, it's pretty interesting. But basically, they're these little cryogenically frozen frogsicles (their hearts stop beating, they stop breathing). And then one day in winter, they start thawing from the inside out. Their brains wake up, their legs start wiggling. Then, with fire in their loins (I presume) they start hopping in search of love (well, probably more of just a hookup. I suspect Wood Frogs are more Tinder than eHarmony if you catch my drift ...). I'm not exaggerating when I say I felt celebratory at learning that these frogs were just doing what they always do, instead of being the harbingers of climate doom I'd feared them to be. Of course, that's not to gloss over a crisis in our midst. It is odd to see daffodils almost in bloom. Buds on trees. Songbirds greeting the morning from trees covered in buds rather than huddled around a snow-covered feeder. It was 72 the other day– I had to dig out summer clothes for the girls. It all feels very premature. Even a bit ominous. But there was some small peace in the constant chaos of our existence right now, that the day the frogs woke up doesn't have to be spoiled by all that. It can be this marvelous little island of a moment floating in the raging seas of my psyche. I really needed that, too. I mean, we really need that don't we? It's there, you know. It's right there under the leaves waiting to jump out and be noticed.